On this special page, we will post news about Anak Krakatau's eruption when a large portion of the island collapsed in the evening of 22 Dec 2018 and caused a deadly tsunami on Java's western coast. New reports and material will be added on the top of the page, so reload it from time to time! Donate for the victims? We are collecting and forwarding donations directly to affected people: go here for more information! - The crater area has closed to become a lake which showed steaming (no explosions have been recorded since yesterday, as the activity has continued to calm down, perhaps only temporarily). - The forest on the island is completely destroyed by ash fall and surges, but still visible. Surviving fishermen who were in the caldera at the time of the event reported seeing massive waves sweeping over the entire, lower island of Sertung (west of Anak Krakatau), estimating them to be about 25 m in height. The attached image compares several detailed satellite images taken before, immediately after the tsunami on 22 Dec 2018 as well two and five days later, and gives an interpretation of what caused the tsunami (= a collapse of the western lava benches). 22 Dec: part of the lava flow terrace that forms the western shores of Anak Krakatau collapse, probably involving a significant underwater volume. This caused the tsunami that hit the Java west coast around 21:30 local time. 23-24 Dec: additional collapses (but involving much less volume each) in combination with violent explosions remove more material from the island, eating away until the whole summit cone is gone (3rd picture). 25 Dec: heavy and very wet water-lava explosions deposit meters of fresh, wet ash and blocks all over the island, along with sea current that wash the muddy material to shores. This way, the crescent-shaped island seen on the 27 Dec (and later) pictures with the open crater bay is formed. Significant land addition has extended the island's eastern shores (compare the satellite overlay image posted earlier). Radial erosion gullies formed quickly as result of torrents of water carving down the loose material now covering the island. This water is both from a) heavy rains as well as b) ejected liquid and b) condensation of steam from the water-rich explosions. 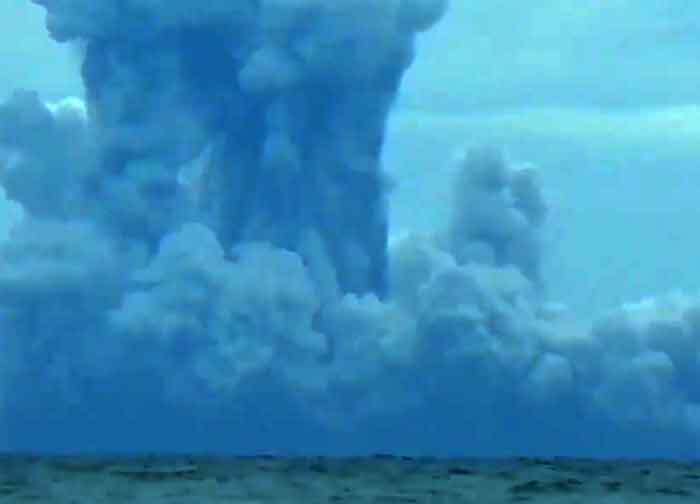 Here are some of the most terrifying explosions on Anak Krakatau recently filmed. 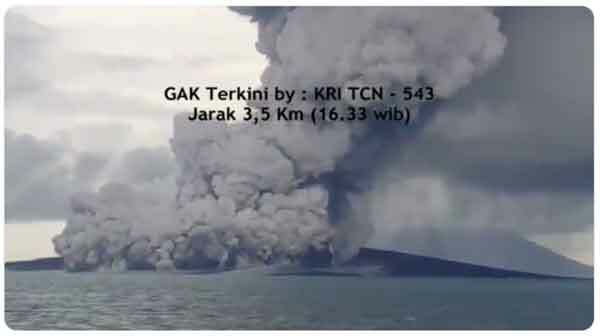 Our correspondent Doni Janskulo from Kalianda, Lampung, took advantage of very clear views yesterday and managed to take some of the most extraordinary and dramatic footage yet of the explosions on collapsed Anak Krakatau island. Even though it is from 40 km away, it shows the activity in amazing detail. It takes place at the island of Anak Krakatau, hidden from view now behind Panjang island seen in the foreground. The active vent is now under water and lets sea water interact violently with the rising magma: the result is so-called Surtseyan activity, a type of volcanic eruption that takes place in shallow seas or lakes, named after the island of Surtsey which appeared off the southern coast of Iceland and had this activity in 1963. In this video, very powerful explosions can be seen generating jets of ash, debris, steam and water to several hundred meters ("rooster tails") radially from the explosion point. 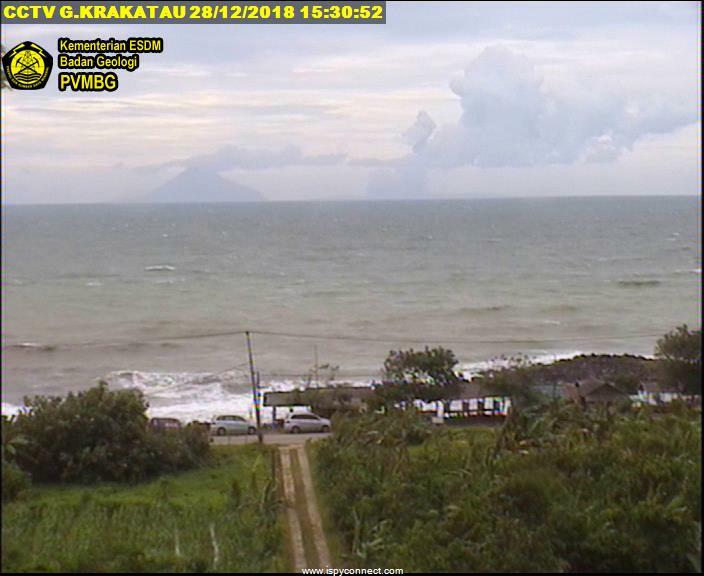 In addition, large surges (horizontally expanding hot clouds of steam mixed with ash) can be seen sometimes engulfing the whole island of Panjang, which is hiding the view of Anak Krakatau itself. Be sure to watch to the end, at times, the explosions tend to be bigger and bigger throughout the video. The video was generously granted for display here by local resident and videographer Doni Janskulo, who lost most of his equipment during the 22 Dec 2018 tsunami that devastated Java's west coast. If you want to support him, subscribe to his youtube channel or embed this video. 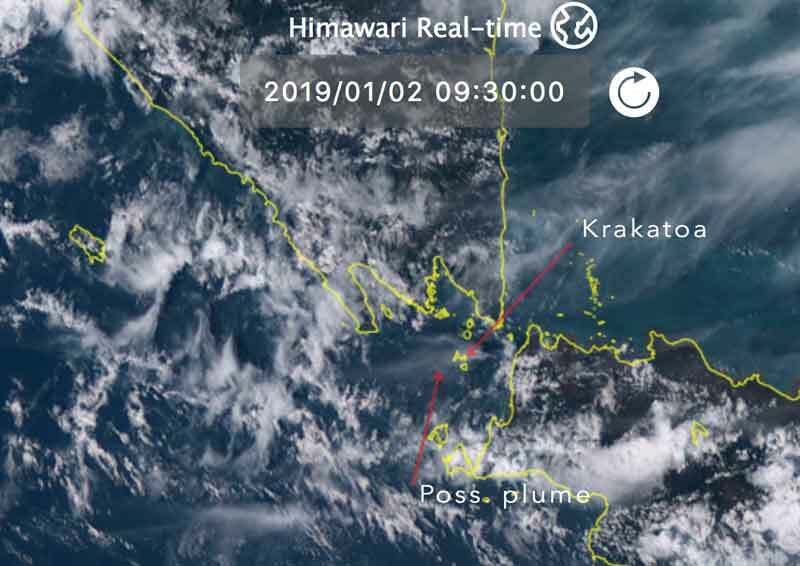 Sometimes strong explosive activity seems to continue at the volcano: VAAC Darwin reported an ash plume that rose to 40,000 ft (12 km) altitude this morning as well as "regular, intermittent" emissions of volcanic ash to 35,000 ft (10 km). Seismic activity is still relatively low, but has picked up again after a phase of near absence at the end of 2018.
it shows in more detail what the 29 Dec satellite image already confirmed: the island of Anak Krakatau has now the shape of a 270 deg almost closed crescent, with a water-filled crater in the center where once the 330 m tall summit cone stood (which collapsed on 22 Dec causing the tsunami). Although the image is not detailed enough, it seems (and it would be expected so after the violent phreatomagmatic activity following the collapse) that virtually all of the island has been covered and reshaped, smoothed out by fresh pyroclastic deposits. What if any of its flora and fauna has survived needs to be found out yet by visiting it. It shows that actually not all, but most of the summit cone is now missing as well as significant parts of the western and southern shores previously formed by young lava deltas. On the other side, there has been a significant enlargement of the coast on the eastern shore. 2) how much of it might have been added by a) the violent explosive activity during the following days, and/or b) how much of it can be attributed to sea currents washing loose material deposited into the sea back to shore ? The latter is likely to be significant, as the coasts in the eastern parts of Anak Krakatau are very shallow, and large amounts of mud can be seen floating around Anak Krakatau in the satellit image. 3) Another question is how large was the collapse that actually led to the generation of the tsunami? Was it only one? - did the summit cone collapse in one go, or did several collapses occur? The latter idea might explain that there were two tsunami waves observed, the first being relatively small, the second one following after a few minutes (but not immediately) and much higher. At the moment, as mentioned, we can not give answers. But at least some of them could be given by doing more research and, first of all, by detailed ground observations. We hope our team on location around our expedition leader Andi will be soon able to visit the island from close and bring us more information. - As a consequence, Anak Krakatau island is no longer visible from the mainland, as the island of Panjang (Long Island) blocks the view from Java's west coast. - The volume of the collapse is estimated to be between 150-180 million m3, while the remaining volume is currently estimated at between 40-70 million m3. - For this reason, unless tectonic faults in the area of the Sunda Strait are activated, the risk of other massive landslides and tsunamis is currently deemed to be low. However, it is likely that the current eruption continues and is only in a phase of low activity currently; if the cyclic pattern of increased supply every few weeks continues, another phase of stronger activity during January would not be surprising. After almost 6 days of an almost non-stop ash plume to 55,000ft following the devastating collapse, Darwin VAAC reports that activity has finally subsided with only very minor emissions. No updates about local conditions at the moment. 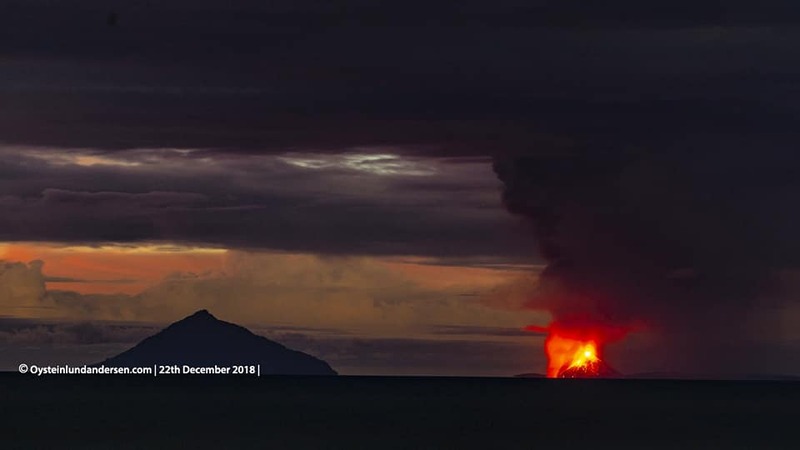 The violent explosive activity caused by magma-water interaction continues at the volcano, from the area where the summit cone collapsed on 22 Dec and now exposes the vent to sea water. A video of an overflight earlier today shows powerful steam explosions of this so-called Surtseyan activity, generating dense steam and ash clouds, often ejected as "fingers" of larger ejected rock fragments with training steam behind, as well as billowing surges that shoot horizontally above the water. Civil Protection (BNPB) raised the alert level of the volcano from Waspada (Level II) to Siaga (Level III) on the Indonesian 1-4 scale and the exclusion zone was extended from 2 to 5 kilometers around the volcano, where people are prohibited from carrying out activities. Seismic activity from the volcano has been lower following the paroxysm on 21-22 Dec, following the pattern of phases of increased activity roughly every 3-4 weeks, suggesting that magma supply to the vent is currently reduced. 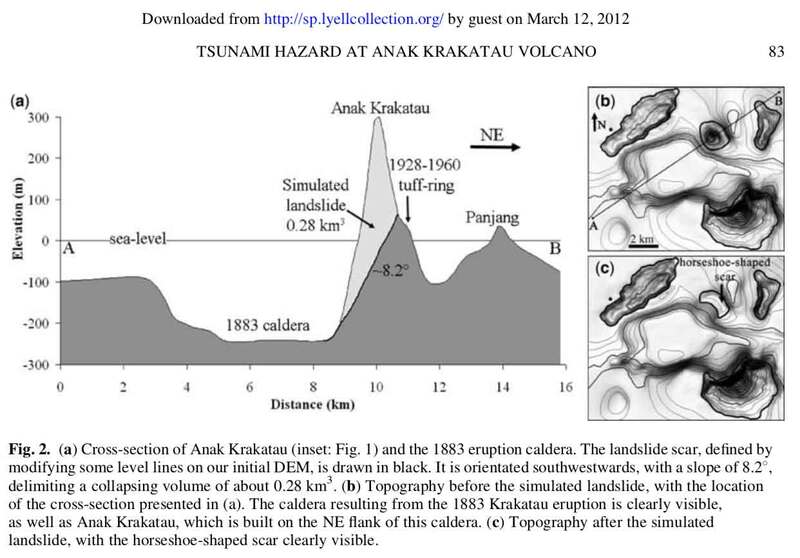 In their paper adequately called "Tsunami hazard related to a flank collapse of Anak Krakatau Volcano, Sunda Strait, Indonesia", they "numerically simulate a sudden southwestwards destabilization of a large part of the Anak Krakatau Volcano, and the subsequent tsunami formation and propagation." Anak Krakatau island - the intra-caldera complex called "Child of Krakatau" - has been growing rapidly growing since it first breached the surface of the sea in 1928. Since then, in less than 100 years, it built an overlapping cone during several eruptions, the latest being the one that started May 2018 and still continues. What makes the island particularly prone to gravitational flank failure is that it has been constructed close and above a steep submarine slope, the NE margin of the caldera basin left by the massive 1883 eruption. As a consequence of this underwater topography, combined with strong sea currents, the western slope of Anak Krakatau has developed to be much steeper than the eastern. Giachetti et al. observed that as the volcano continues to grow towards the SW (which it had done particularly well visible during the recent eruption, s. attached image comparing 2007 and 2018), "landslides along its southwestern ﬂank cannot be excluded. Such a landslide would be directed southwestwards into the 1883 caldera and would trigger waves that would propagate into the Sunda Strait, possibly affecting the Indonesian coasts". The modeled waive heights in various location correspond amazingly well with what had been observed. At Anyer, for example, waves of up to 1.5 meters would arrive in 38 minutes. Inside the caldera, neighboring islands such as Rakata or Sertung would be hit by waves 15-30 meters in height in less than a minute after the event. Since the local tsunami warning systems in place was built only with earthquakes as trigger in mind, no warning could be given to the people on the beaches. In addition, the flank collapse occurred at night and the resulting large ash plume (which eventually reached about 15 km altitude), and violent steam explosions as result of sudden interaction of water with magma and hot rocks could not be seen by people. When the tsunami waves arrived they caught everyone by surprise. It should be noted that the report was written 6 years ago. Since then, the new eruption, everything described in there had even become more true: compared to the situation described in 2012, the cone of Anak Krakatau had significantly been enlarged to the SW and grown in height by estimated 30%. 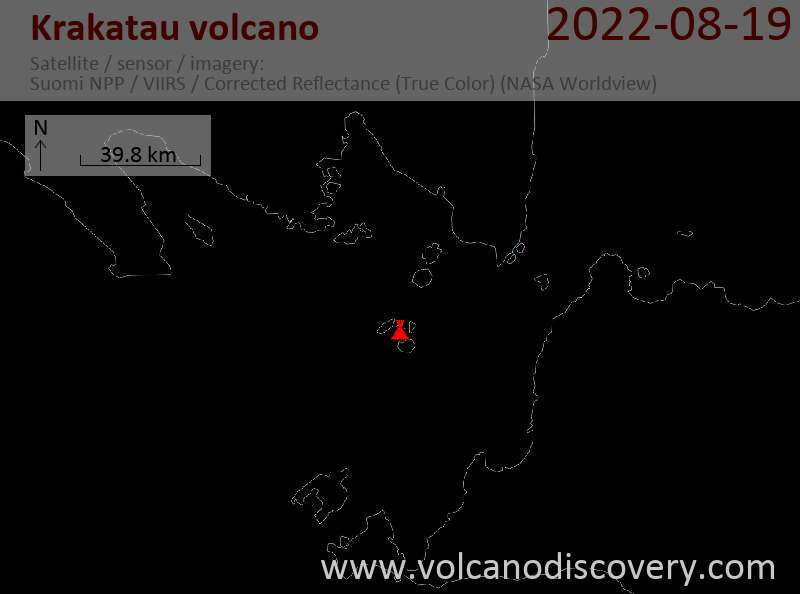 As of now, it appears that the activity at the volcano itself has calmed down again, following the pattern since June of phases of increased magma supply occurring rhythmically about once every 4 weeks, followed by quieter phases. T. Giachetti, R. Paris, K. Kelfoun and B. Ontowirjo (2012) "Tsunami hazard related to a ﬂank collapse of Anak Krakatau Volcano, Sunda Strait, Indonesia"
According to the latest information from official sources, the toll of the tsunami climbed to at least 429 people killed, 1485 injured, and 154 still missing. Many people among the victims were caught by surprise in their sleep. At least 882 homes and 73 hotels were damaged or destroyed. If you like to send a small donation for the victims of the Dec 2018 tsunami in Java (Indonesia), we are providing a direct channel to do so: we collect donations through our PayPal account and forward this money direct to our local expedition leader Andi who delivers this money directly to affected people in need through his organization ITGA / HPI. 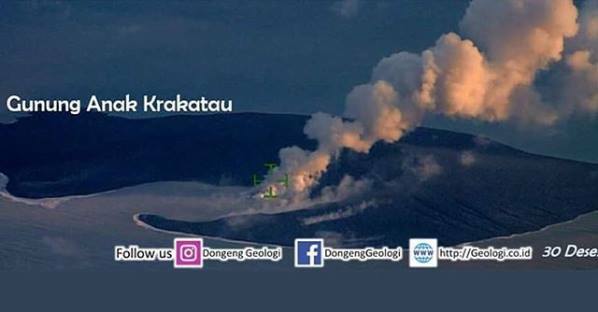 Strong activity at Krakatau before the peak of the activity later in the evening, taken on 11:15 local time on 22 Dec by website visitor Gabriela Garcia who kindly submitted a volcano report. On a side note, it is quite strange to see that it took international media about 8-9 (!) hours before they became aware of this major disaster. The tsunami occurred around 21:30 local time (14:30 GMT), but it was only about 8 hours later, on the next morning (local time) or late evening GMT time that Øystein Lund Andersen posted his eyewitness report, which we picked up first and only then it spread quickly around the world to all channels. Unfortunately, the death toll of the tsunami last night continues to rise. So far, at least 62 fatalities and 584 injured people have been counted by authorities. A major explosive eruption might have occurred at the volcano earlier this morning. 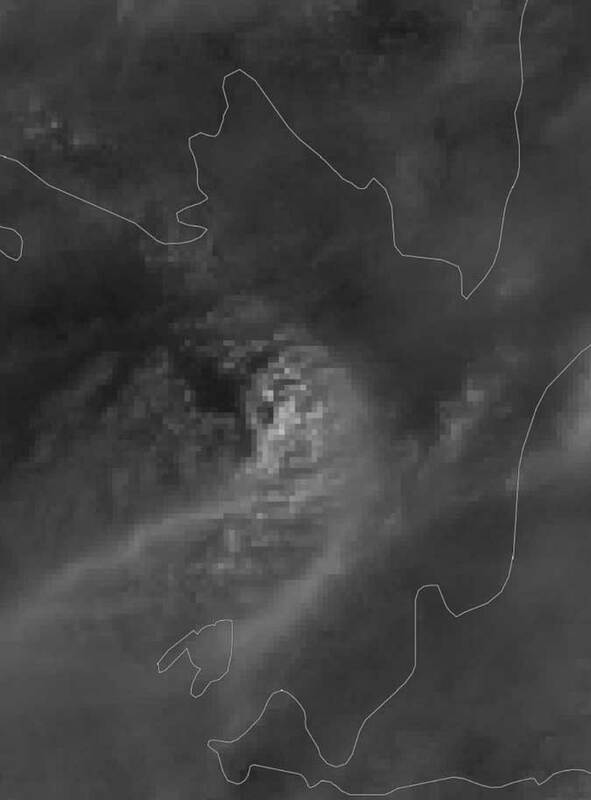 VAAC Darwin spotted a large cloud, possibly an ash plume from the eruption reaching approx. 55,000 ft (15 km) altitude and drifting S and SW. Whether it is is from the eruption still needs to be confirmed, but seems rather likely. What role the yesterday's deadly tsunami plays here is also still unknown, but they are hardly unrelated. Die gegenwärtige Ausbruchsphase des Vulkans ist ungewöhnlich heftig. Sie hat sich anscheinend sehr schnell in den vergangenen Tagen gesteigert. Auf Bildern unseres Freundes Øystein Lund Andersen von vor wenigen Stunden kann man sehen, dass Lavaströme erneut das Meer erreichen und am Gipfel Lavafontänen ausgestoßen werden. Während Øystein den Vulkan vom Strand aus fotographierte, erreichten plötzlich große Wellen, vermutlich ein kleiner Tsunami, den Strand und überfluteten die Küste über zunächst 15-20 Metern, und danach bis zur Straße und die anliegenden Gebäude. Øystein konnte sich mit seiner Familie in höheres Gelände retten, aber fürchtet, dass es viele Verletzte und möglicherweise Todesopfer zu beklagen gibt. Möglicherweise wurden die Wellen als Tsunami durch heftige Explosionen (und damit einhergehenden Bodenbewegungen) des Vulkans verursacht, was auch die lokalen Behörden vermuten. Klarheit und genaue Informationen zu diesem Ereignis gibt es bisher allerdings nicht, und auch in den anderen Medien ist bisher nichts Besonderes darüber zu finden. Hoffentlich bedeutet dies, dass der angerichtete Schaden kleiner als befürchtet ausgefallen ist. UPDATE: Eine andere (und vielleicht wahrscheinlichere) Möglichkeit ist, dass die Wellen einer ungewöhnlich hohen Springflut entstammten. Eine weitere starke Eruptionsphase (Paroxysmus) findet offenbar gerade am Vulkan statt. 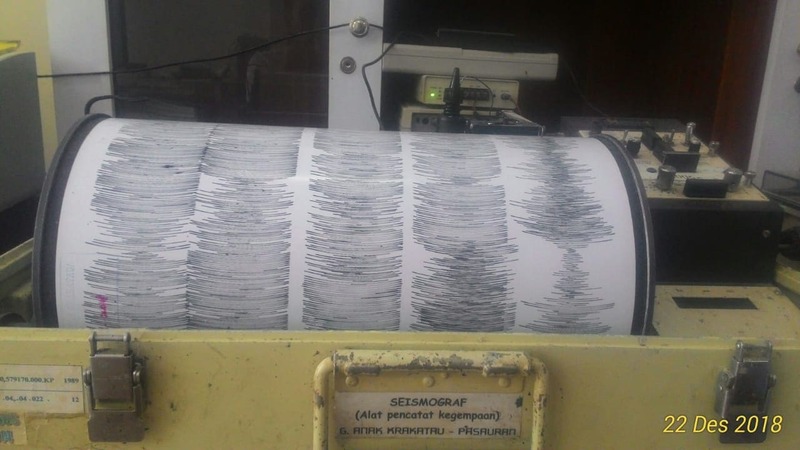 Die Seismik am Anak Krakatau hat in den letzten Tagen stark zugenommen und zeigt jetzt kontinuierliche explosive/effusive Tätigkeit. Das Observatorium informierte uns, dass ein Lavastrom aus dem Gipfelrater fließt. Es ist anzunehmen, dass dies von Lavafontänen bzw starker strombolianischer Tätigkeit begleitet ist, wohl ähnlich wie das, was wir während unseren letzten Expeditionen zum Krakatau beobachten konnten.